Last week, CNN had the low-tech solution for mapping the conflict in Crimea, boy the difference a week makes. 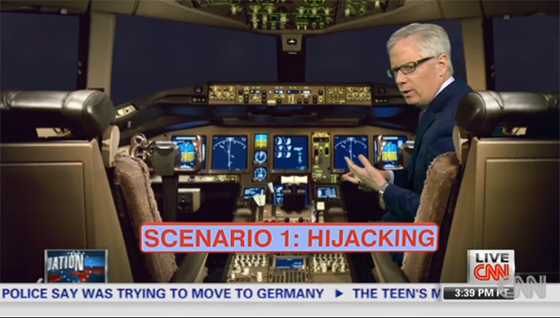 Now, CNN has went all out for missing Malaysia flight 370. 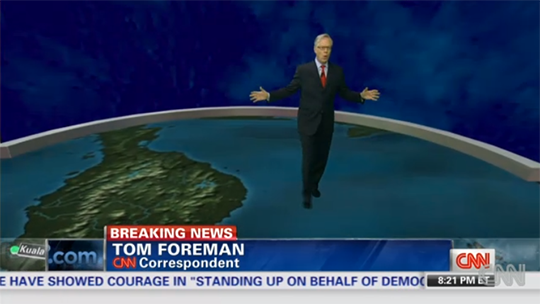 Reporter Tom Foreman has been locked in the CNN chromakey studio giving constant virtual updates, complete with a 3D airplane he can sit-in and walk through. While sometimes CNN’s use of its virtual gadgets can be a bit gimmicky (remember the virtual goats? ), this time actually makes sense. It’s all a big mystery with no visuals but maps. Of course, every network has brought out an animated plane showing the flight in air (waiting to debut the one showing it crash). CNN has taken it a step further, putting Foreman on the plane and letting him explain some of the scenarios for what could have happened. We just hope in the future, CNN saves all the virtual for something that needs it.